A truly well-cooked dish is more than just a well-cooked dish. If it was just a well-cooked dish then that would deny food the attention it deserves and we wouldn’t have magazines and TV shows entirely dedicated to the pleasure of eating. A truly well-cooked dish should be the picture to a story. For any chef will tell you that you cannot have one without the other. Well, at least someone like chef Martha Hubbard would. Food travels to us, we travel for food and in so doing, it should tell of the all the great things like people and community. This is how Martha became the admired chef she is today. We are at Isle Cook on the north end of Whitehead Street. It’s a specialty shop that is also a cooking school with the occasional intimate dinner where Martha is the resident chef. We are surrounded by everything that would give the appearance of a culinary store. There are carefully displayed tables, fully stocked shelves, a selection of boutique wines. In the middle of the room there is also the evidence of something else. A long black counter with a single, four-burner stove sits cold and clean. It’s the focal point of all Isle Cook demonstrations and presentations. Yet, Martha isn’t turning down the back right and heating up the front left to make Azerbaijan-style pancakes with yogurt rose petal dip or bacon wrapped rainbow trout with hazelnut brown butter and braised collard greens. She isn’t showing a class of eager students how to keep hollandaise sauce from breaking or knowing how to tell if a steak is done medium or medium rare. Today is her day off and I have her full attention as she tells me stories of food and travel and how that has become the culture of Isle Cook. Or she has my full attention I should say. Martha has quite a story to tell. They are all questions that each well-cooked dish should bring up. They would be the very same questions that she would ask as she made her way from one place to the next, from her humble beginnings as a salad prep in Newport, R. I., to discovering the underground ovens of Fiji. For a full year she worked her way around the world. In New Zealand, she picked onion seed for two days and then for a week traded her mashed potato recipe in exchange for a generation’s worth of curry secrets at a café in Phuket, Thailand. She would bring all these moments to Key West with her and, after a reputable gig at Louie’s Backyard, can now bring them back to life thanks to owners Bill and Eden Brown, who recognized Martha’s rarity after she stopped by one day to talk to them about the business concept and possibilities. After hosting a dinner one night, she decided that it “was the coolest thing Key West has got.” Not long after she walked out after that fateful conversation, they called and offered her the job. There was an undeniable chemistry between them. It was just one of those things that made perfect sense. “It’s art. Chefs are not going away; we are evolving,” she says. Ask any chef in Key West and he or she will tell you that she is one of the best. Chances are they have even taken a night off from their busy schedules to create a harmoniously coursed meal for a handful of people at her four-burner stove. It is something of an honor to cook there. They almost always choose a theme to follow, like Martha’s Persia or Bust! or guest chef Melissa Schwartz’s Indian dinner, where the face-to-face, cooked-to-order food turns an otherwise casual evening into dinner and a show. Not only must the chefs execute the food without fault, but at the same time they have to entertain a group of hungry customers who have their own set of questions to ask. And if you know chefs at all, you know that they are not always the chattiest of people. They usually like to stay on the other side of the swinging door, where the only sounds are the fire of an order and the ring of a bell. 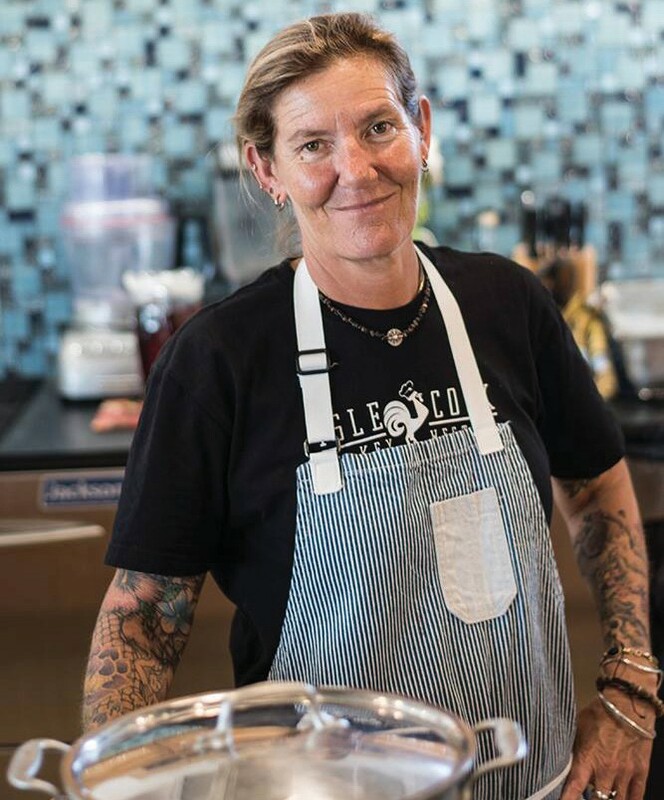 “Isle Cook allows chefs to introduce themselves to the community and to see the reactions to their food,” Martha says. Great article about one of my favorite Chefs who is also a friend. Enjoyed your article very much. Would enjoy reading about other Key West Chefs, also. We are interested in joining a class. 3/7-3/9. Is there availability ? To make a reservation for a class at Isle Cook, please contact them at (305) 741-7443.